Caciocavallo, a mild cheese similar to provolone, pairs perfectly with La Quercia Nduja, a spicy, spreadable blend of chorizo and prosciutto. 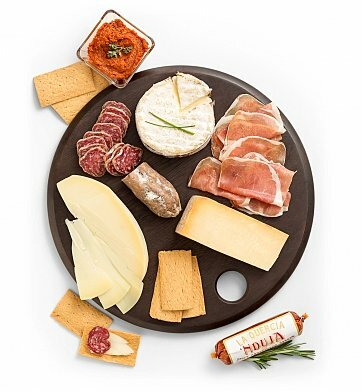 Presented with a clothbound English style cheddar, a wheel of oozy Harbison and lots of perfect thin slices of sopressata, this cheese and charcuterie gift crate from Murray's is destined to delight. Clothbound Cabot Cheddar, 1/2 lb. Smooth and Mild Caciocavallo Cheese, 1/2 lb. Creamy Harbison Wheel, 12 oz. Thin Sliced Prosciutto San Daniele, 3 oz. Slow Aged Sopressata Salami, 6 oz. Spicy La Quercia Nduja Spread, 5 oz. Perfect Pairings! Try pairing the fare in this gift with a spicy Italian red wine like Barbera, a dry rose or a rich brown ale. Premier Cheese and Charcuterie Feast is a hand delivered gift. These gifts are delivered by one of our local design centers located throughout the United States and Canada. Same day delivery is available for most gifts when ordered before the cutoff time. The cutoff time for Premier Cheese and Charcuterie Feast is 2 AM in the recipient's time zone. Items arrive securely arranged in a signature wooden gift crate.